Television dates back to the 1920s, well before the widespread use of digital technologies. As television technologies matured, a vast investment in an analog-centric infrastructure was made which accumulated over decades on a global basis. During this same time, separate industries were emerging that stored and manipulated data in digital formats, most notably the computing industry. Soon to follow was a digital data communications network called the Internet. Although the television industry is still heavily invested in an analog infrastructure, it is characterized by a continuing move to digital. The mantra for this migration is the "Next Generation Network", NGN, or commonly referred to as "All IP". The NGN is a fully digital ecosystem, from production to consumption. Digital cameras, digital storage, digital manipulation, digital distribution, digital displays. Two challenges emerged as the television industry started going digital. First, the protocols for inter-computer communications were insufficient for the very high level of service quality expected from television. Second, television had been a 'walled garden' that enabled it to be successfully monetized. The television industry of today continues to struggle with the adoption of a digital world. Enter IPTV, the emerging standard for IP based television services. IPTV uses a series of IP based protocols to deliver standard and high definition television content with quality of service while preserving the rights of the content owners. Television follows a common high-level content workflow that starts with production, travels through distribution, and leads to consumption. Although this is the workflow for content, it is also very important to consider it from the user's perspective; specifically, from the consumer selecting content and having the distribution network deliver it. From the user inward to the content source, or from the content source outward to the user, the overall mechanisms are the same. Production means all of the methods of creating content and preparing it for distribution. This ranges from live news crews to prerecorded, high-production-cost television shows, and everything in-between. This process can still use analog cameras, which captures analog pixel values and converts them into an analog signal for transmission. For IPTV, this signal will be eventually converted into a digital data stream. This conversion can occur during production, or downstream during distribution. Sidenote: Analog cameras break a visual scene into lines called rasters, each of which is comprised of pixels. The value of each pixel, in analog, is scanned and sent out of the camera as an analog signal. The signal is combined with additional information to synchronize horizontal and vertical information. When the scene is all combined into one signal, it is said to be 'composite' video. When the scene is separated into color bands, it is said to be 'component' video. Sound is added as a separate signal and carries its own synchronization mechanism with the analog video signal. Digital cameras however are the new standard. These cameras output a digital data stream already packaged in a format consumable by other digital equipment at the production end. The methods for content production are far too numerous for this blog post, which is focused on IPTV in general. The salient take-away is that the content is either created or converted into a digital data stream at some point during it's journey to the user. Distribution is where the fun happens, at least from a technical perspective. The inputs to distribution can be an analog signal or a digital data stream. If it is analog, it will get converted into digital right away so as to simplify management of IPTV distribution. Data formats of digital video content has been steadily coalescing and advancing over the last decade. Today, a primary format during content delivery is MPEG-4 Part-10, or ADC, which defines a specific encoding format for video data. MPEG-4 is a technology allowing the digital data to be compressed so as to take up less bandwidth. The distribution network will typically accept a variety of inbound data formats. These can be MP3, WMA, AVI, WM9, MPEG2 and others. Each of these formats requires more bandwidth than MPEG-4, so 'transcoding' them into MPEG-4 for delivery to the consumer is beneficial. Transponder - used in satellite communications, merely takes received content and retransmits it back to Earth. The first two systems use a radio wave medium. Satellite and terrestrial systems have no physical connection from transmitter to receiver. Instead, they use radio frequencies, RF, to move the content. One of the biggest advantages to using RF is the ability to broadcast content to an unlimited number of receivers without needing an electrical circuit for each. One of the biggest disadvantages is the medium Is unidirectional. There is no reasonable way for a receiver to transmit back to a radio tower or to a satellite. The last two systems use an electrical medium. Cable and DSL systems use a wired connection between the transmitter and receiver. One of the biggest advantages of this is the ability to have bidirectional communications. One of the disadvantages is the cost of building and maintaining the infrastructure. Sidenote: There are, of course, wireless Internet access systems but these are short-path technologies. At present they are not dominant. Most Internet access is by coaxial cable or twisted pair. The adoption of wireless technologies, however, is accelerating. This includes Wireless Wide-Area Networks, WWANs, and Cellular networks. The rapid growth of the smartphone market has had a very large impact on cellular infrastructure. Sidenote 2: There are other forms of Internet access aside from cable and DSL, but we'll stick with these two mainly because of their dominance. Sidenote 3: Satellite and Terrestrial systems do have backchannel technologies to enable bidirectionality, but these are typically using an existing cable or twisted pair connection already in place at the receiver location. IPTV requires bidirectional communications. The user must be able to send commands and receive the intended response. Riding on top of one of the above mediums is a set of technologies enabling this. What follows is a reasonable dive into the technical underpinnings of content delivery, including a look into the protocols used in IPTV. 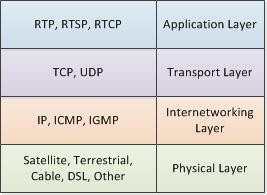 IP, ICMP, TCP and UDP are widely known and will be skipped here. We'll focus on IGMP, RTP, RTSP and RTCP. The Internet Group Management Protocol is a routing protocol for managing one-to-many internetworking. The most common forms are multicasting and broadcasting. Without IGMP, broadcasting would simply be prohibitive because we would have to create a separate data stream per user, thereby quickly consuming all available bandwidth of the network. Multicasting is a one-to-many routing scenario, and broadcasting is a one-to-all scenario. In IPTV, if we have one media server and are streaming to 50 out of 100 other computers, then we are multicasting. If we were streaming to all 100 other computers, we would be broadcasting. IGMP is what lets us accomplish this feat by efficiently using network bandwidth. It is, of course, not a panacea. We can still swamp the network, but it does allow us to use whatever bandwidth we might have in an efficient manner. The Real-time Transport Protocol is the primary standard for real-time, application-to-application streaming of data on IP networks. Because of the real-time nature of the protocol it typically used for audio/video applications such as IPTV and VOIP (Voice Over IP). These applications can often tolerate some packet loss in preference to keeping the stream as close to real-time as practical. Unlike applications that can not ever lose a packet such as database communications, RTP applications are a special category where an occasional loss of a data packet will not cause catastrophic harm. The consumers of audio/video applications are typically human beings who either cannot discern the loss or can easily tolerate any intermittent and minor degradation in the quality of the audio or video. RTCP is the RTP Control Protocol, and as the name implies, is a very close cousin to RTP. In fact, it is defined in the same RFC. RTCP provides out-of-band statistics and control information. Its job is to provide quality of service information about an RTP stream, but does not participate in the transport of any stream data itself. Stream data transport is the job of RTP, controlling this transportation is RTCP. By gathering statistics such as total bytes sent, total packets sent, number of lost packets, jitter, time delays, feedback, and others, RTCP provides the information to a server and client applications that can be used to improve the quality of service. With RTP and RTCP we have a very good pair of protocols for streaming possibly lossy data and monitoring the quality of service. The final protocol is RTSP, which provides all of the streaming media server controls such as play, pause, record, and stop. What HTTP is to a web page, RTSP is to multimedia playback. Security in IPTV is not simply turning on a secure transport to thwart man-in-the-middle attacks. It goes much deeper into content and producer protections such as Access Control and Copyright Protection. Access control addresses the need to ensure access to legitimate consumers of content while preventing access to others. This is commonly thought of as an "AAA Protocol", standing for Authentication, Authorization, and Accounting. Conditional Access is another access control mechanism that is usually associated with satellite television. It uses smartcards to authenticate and authorize access to content. One standard behind Conditional Access is from the Digital Video Broadcast Project called DVB-CA. Conditional Access across cable television is standardized by CableLabs. In this scenario, a CableCARD is used to enable access to content. The CableCARD is a PCMCIA card used in some DVRs, PCs and TVs. Copyright protection is a sensitive topic in the media industry, for both the content creators and content consumers. For example, the mere mention of Digital Rights Management, or DRM, can kick off a tirade with some individuals. Nevertheless, whether you are for or against copyright protection mechanisms, and DRM in particular, it is important to know the main components and to understand that IPTV could not effective function without copyright protection in some fashion. Digital Rights Management includes mechanism which inhibit the use of content by end users. It essentially lets the seller retain control over access to their content, even after it is sold to the buyer. The control mechanism may be as simple as licensing terms, the encryption of content, or embedding a tag, such as a 'broadcast flag', into the content itself. In IPTV, the Digital Video Broadcast Project, DVB, has adopted this broadcast flag as a means of controlling access to digital content. This flag is injected into the data stream and indicates whether the content can be recorded or not. The receiver of the content should check for this flag and take appropriate steps to 'thwart piracy'. Finally, social norms are also used for copyright protection. Anyone who has seen the opening segment of a DVD that shows a "Do Not Copy" video clip has experienced the push to establish a social norm that copying of protected content is socially unacceptable behavior. A growing trend is the adoption of SmartTVs that access television through cable or dish as well as have an Internet connection. These televisions have built-in capabilities to access the Internet and content. Some, such as Samsung's SmartTV line, can download custom apps that run directly on the TV, essentially extending the television into an app's display. For the average user, the behind the scenes technology will never be of interest. The experience is what they are seeking. There will be an increasing move toward personalized television, time-shifted television, and other uses of the television console such as an Internet browsing device and app platform. As IPTV continues to mature, the devices capable of serving television content will proliferate. IPTV has already adopted all of the monetization models of traditional television. It is using advertising, subscriptions, and pay-per-view models. As the technology and business models mature, IPTV will continue to evolve into multiple segments of education, entertainment, and communications.